While some of us think the weakness in Subaru’s lineup is a lack of a five-door WRX, the vast majority of buyers were clamoring for a bigger Outback with three-rows of seats. The 2019 Subaru Ascent is here for that, and it’s also here to print money. While it competes against the segment benchmarks like the Honda Pilot, Toyota Highlander, and Ford Explorer, the Ascent is almost the size of a Chevy Tahoe. It as if Subaru took the mild-mannered Outback and blasted it with gamma radiation, which resulted in this hulk of a crossover. 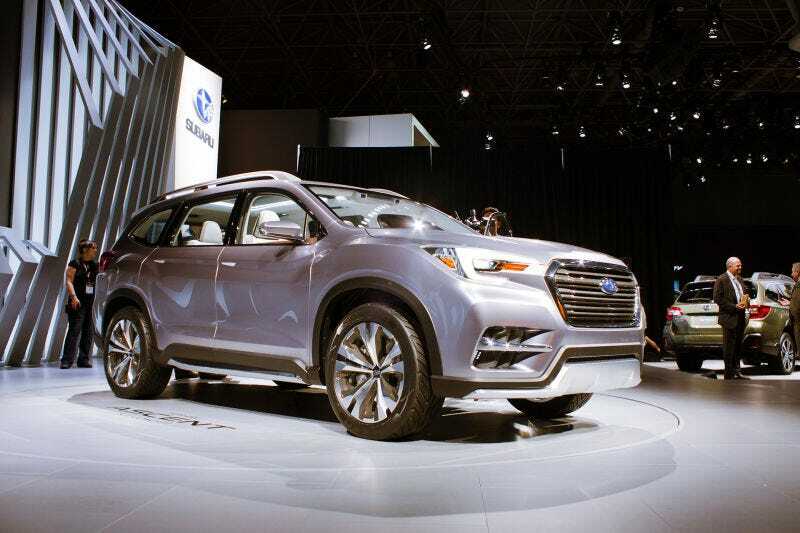 Starting price for the biggest Subaru ever comes in at $32,970 (including destination), and while that may seem high when compared to the base MSRP from some competitors, keep in mind that Subaru’s all-wheel drive system and EyeSight safety suite are standard, which closes the price gap significantly on competing crossovers that are similarly equipped. The volume seller will likely be the Limited that gets you leather seats, Wi-Fi, power tailgate, keyless access and 20-inch wheels. That one will set you back $39,970 (including destination), which is only $535 more than a Honda Pilot EX-L AWD. Power comes from a 2.4-liter turbocharged boxer four-cylinder that pumps out 260 hp and 277 lb-ft of torque mated to a CVT. Despite what seems like a weak powertrain combo compared to the big V6s from the competition, the Ascent is rated to tow up to 5,000 pounds, and also has the benefit of returning up to 27 MPG on the highway. Subaru is starting to push “upmarket” as they say, and the brand has been known to poach a few buyers who maybe once considered Volvo or Audi. For those folks, the fully loaded Ascent Touring that adds second-row captains chairs, panoramic moonroof and a Harman Kardon Stereo will run $45,870, which is the most expensive Subaru crossover ever, but still undercuts a fully loaded Highlander Platinum at just over $47,000. The Ascent probably won’t do much mountain climbing. But the large family-sized Subaru and a better than average dealer experience should make for an instant sales success. Correction: An earlier version of this story said the Ascent is the most expensive Subaru ever, but we forgot about the WRX STI Type RA we just tested, which costs $49,855. The text and headline have been updated to fix this.